ETEC512 Applications of Learning Theories to Instruction, my first course in the Master’s of Educational Technology program at UBC is almost done. There is only one first and every course from here will be bench marked against this experience or at least my every changing memory of this experience. This post is a collection of thoughts about my first Master’s course and a curation of my cohort’s learning theory presentations. A big part of this first course was getting to know my way around the LMS. Similar to navigating a f2f campus to the classroom, it took time to learn the LMS navigational shortcuts. Unlike my f2f learning experiences, I expected the ‘bricks and mortar’ to be open for business 24/7. Unfortunately, in September with so many learners pounding the server access was sometimes unavailable. However, I must applaud the UBC LMS team, for their communication to the community with updates on their progress. All in all, the outages did not impede learning. One wish for the LMS is that it go mobile, unfortunately, I could not enter text without the screen jumping and sticking. At this stage in the game, there is no family/work/school/civic balance. Sleep is a precious commodity. Everything needs my attention, so I have over the course of the semester gotten better at compartmentalizing my energy to the task at hand. My partner has accepted a lion’s share of parenting and I have very understanding colleagues who are similarly busy. My international writing/research group are supportive and flexible and my volunteering activities are likewise forgiving. Unfortunately the two MOOCs that was registered for received little to no attention. I would love to learn how to do it all. Anyone have a strategy? Over the thirteen weeks, I was able to make connections that I believe will continue long after the end of the course and program! However, in the initial weeks, I did not know if this would happen. As, those (3 of you 😉 who are reading this know I like to connect with colleagues. 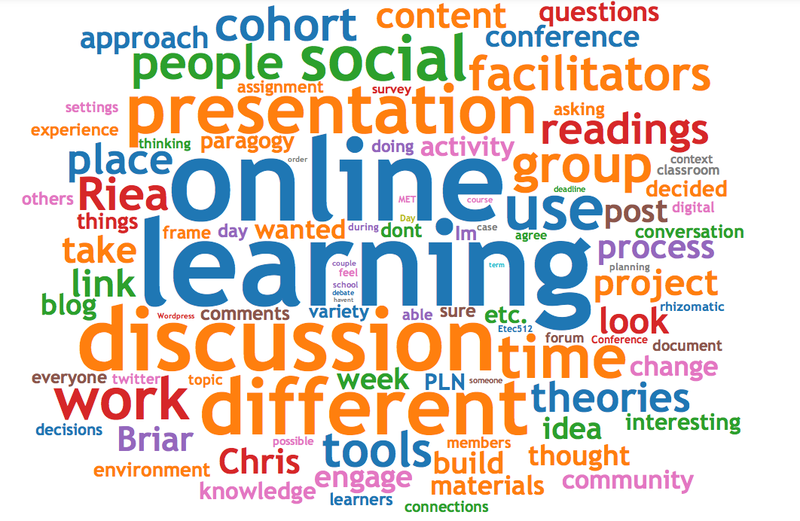 I have become accustomed to MOOC culture of making online connections quickly, generally via Twitter, in forum discussions, or more recently in Google+. I expected connecting to be so much easier in a class of 22 learners; however, it took much longer to develop a connection. I am not sure why, less critical mass of those on Twitter? Different motivations? Balance? Interest in individual outcomes vs collective learning? The discussion forums were generally lengthy posts, so I found it difficult to jump in with quick responses. I felt the added need to ensure my posts were on topic and thoughtful. One thing that I wish for myself, is to find my ‘critical’ or ‘oppositional’ voice with my reflections and posts. One of the best experiences was the group project. I was linked to two other members of the course and they were stuck with me 🙂 Being accountable made me more attentive to their discussion posts and bound me to an ‘invisible contract’ to ensure we met the learning requirements of the project. Ours was the Online Learning Presentation and you can see our behind the scenes document in the Process Document. I was so impressed with the collection of presentations from our cohort, I thought I would curate the links to their presentations. Of course I could link to other academic/published sources, however, I am connected to these presentations by the shared experience of the ETEC512C cohort. The knowledge I have gained of these theories are richer for the online discussions. Each presentation carries my own mental/emotional association of my classmates and I believe this will help refresh my memory faster than some random online resource. These presentations will be my first stop for a Learning Theories refresher. Behaviourism Appreciated the video overview and links to games for learning and it was nice to hear the voice of a classmate. Well presented. Cognitive Neuroscience Jam packed with content, drool over all of the work putting this together for us. Menu of videos to watch and great source of information to UDL and DI, lots of expertise here! Constructivism Come and play! This presentation tapped into my love of exploring online tools, so I made a Voki response. Did not get to the curated videos and links, will do so another time. Expect to navigate several tools, I appreciated the chaos of this approach, especially for finding places to construct meaning. Situated Learning and Distributed Cognition wiki. I want to learn how to talk with content in every breath like these videos Situated Learning: Communities of Practice and Signs! Appreciated the storytelling aspect of this approach, again a device to situate and contextualize the material, excellent. Piaget There were several very clever tools integrated into this presentation, a Piaget Bot for back and forth question and answer. And unusual looking animals to demonstrate Equilibration. Vygotsky This was an excellent presentation that was an ‘unplugged’ slideshare pdf. It reminds me that striped down good content is always good content. There were excellent thought provoking questions. I am waiting for the presenters permission to upload their presentation. A big thank you to my ETEC512C cohort. Looking forward to engaging in future courses.